The number of students enrolled at Bellbridge Primary School has grown rapidly in recent years, with many classes reaching capacity. 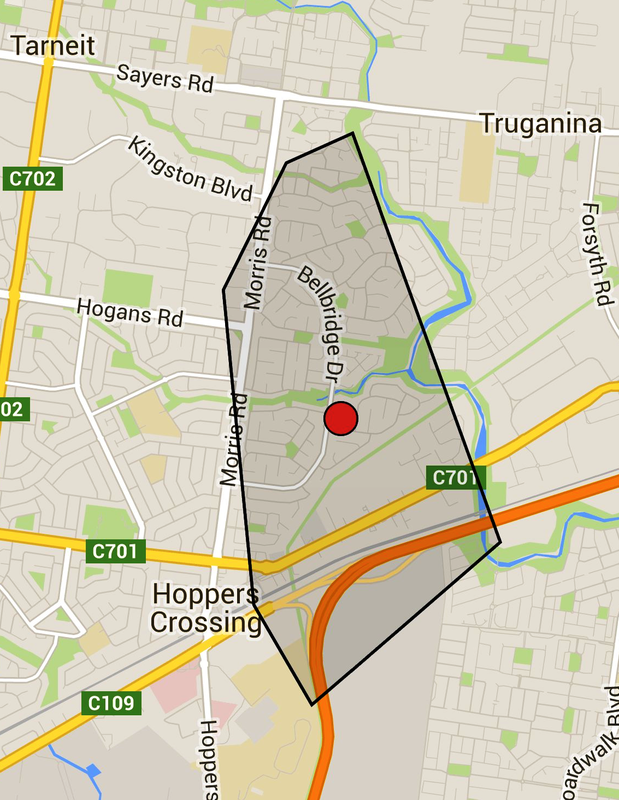 We are now only able to accept enrolments from families who live in our Designated Neighbourhood Area. Proof of residence may be required (e.g. rates notice, electricity bill, rental agreement). While our local area boundaries are roughly outlined on this map, families seeking enrolment who reside within the boundaries of Sayers Rd, Morris Rd, Old Geelong Road and Skeleton Creek are encouraged to contact the school to book a tour and a meeting with a member of the Leadership Team. If necessary, we can assist families residing beyond our local area (in locations such as Werribee, Tarneit and Truganina) with details of their closest primary school options. Enrolments for future Prep students open at the start of Term 2 each year. Click here for term dates. Parents are strongly encouraged to attend one of our weekly school tours (detailed in the footer below), and typically taken by our principal. Bookings are required - 9749 6161. We ask that Prep enrolments are completed by the end of Term 2, or the end of July at the latest. This enables our school to make suitable plans regarding classroom locations and staffing. AGE REQUIREMENTS: To start primary school, your child will need to turn five years old by 30th April in the year they start school. Your child must be at school in the year that they turn six years of age - this is the compulsory school starting age. Families wishing to enrol students in Grades 1-6 are urged to make a booking to attend a school tour (detailed in the footer below). These tours are usually run by the principal. Bookings are required - 9749 6161. We always like to discuss our school's programs and your child's needs - to ensure that we can best cater for the child regarding a suitable starting date, the appropriate class and teachers to place with, and any special needs that we should be aware of. information about the language/s your child speaks and hears at home. Immunisation status certificate, or Immunisation History Statement from the Australian Immunisation Register. Passport/visa for students born overseas. Assessments or health information, such as doctor's instructions for medication or an asthma/anaphylaxis management plan. Court orders in the event that both parents listed on the birth certificate are unable to sign.